The Phasmatidae is one of three families within the Verophasmatodea suborder and is most species-rich in Australia. Parapodacanthus ailaketoae sp.n. 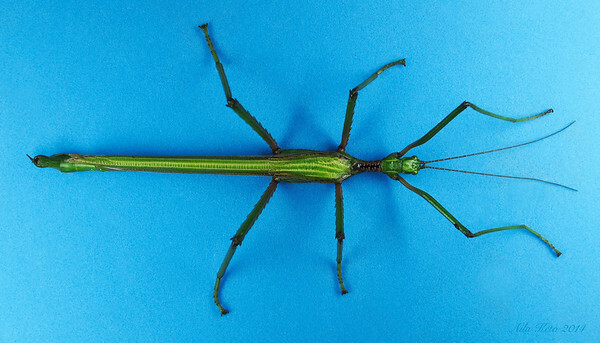 (Phasmatidae, Tropidoderinae) or Aila Keto's Stick -insect. 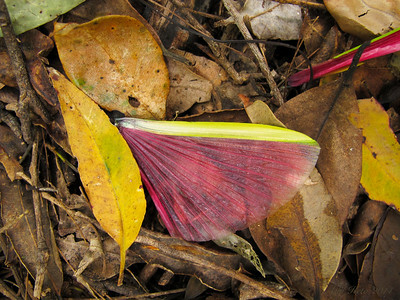 This is a wing of the new species found at Ankida Wildlife Sanctuary in January 2014. The only other species in the genus occurs in the Wet Tropics of North Queensland. it's easy to see why early reports of the species there referred to "fairies with pink wings". This individual most likely met an unhappy end in the stomach of some bird. Parapodacanthus ailaketoae sp.n. (Phasmatidae, Tropidoderinae) or Aila Keto's Stick -insect. This new species found by us at Ankida Wildlife Sanctuary in January 2014. The only other species in the genus occurs in the Wet Tropics of North Queensland. It was formally described and published by Paul Brock and Geoff Monteith in 2018.